Move over, 60 inch widescreens—for the first time ever, U.S. consumers are spending more time in mobile apps than on TV. An article from Flurry Insights, the blog for Yahoo’s mobile analytics service, covered the recent viewing trends. Apps are now the top media channel in the United States: on average, people spend 198 minutes on mobile apps every day, while spending only 168 minutes watching TV. The article noted that the 198 minutes spent on apps does not include time spent on a mobile browser: with that time added, users spend 220 minutes on mobile devices every day (a little more than 3.5 hours). 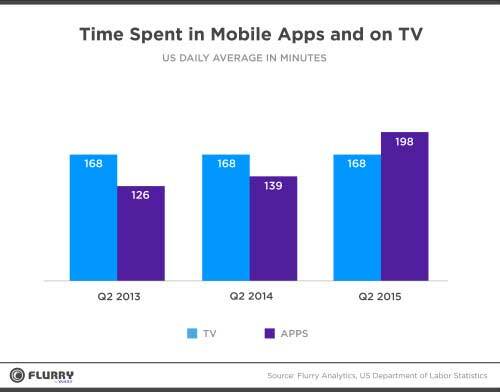 Of course, the numbers don’t account for users who are watching TV while also using their devices. Regardless, the trend is clear and supported by other research: mobile is a primary way that people access everything from social media to government information. Although Flurry’s article is focused solely on apps, the need for mobile-friendly government content and services is clear, even for agencies that don’t have native apps. When users spend more than 3.5 hours per day on mobile, they expect mobile-friendliness. Mobile video consumption is also on the rise. In 2014, mobile devices accounted for 40% of time spent watching video worldwide, and that number is expected to increase to 53% in 2016, according to a recent MediaPost article that analyzed a report from Ooyala. Agencies have tapped into the video trend, whether they are delivering multilingual content or streaming live video, and they should continue to consider video as a platform for providing important information. Mobile offers unprecedented opportunities for agencies to reach the public. Old barriers, such as paid television advertisements, have lost ground. The ability to reach users in the comfort of their own devices opens new frontiers for agencies to deliver and meet the public’s needs. Sign up for our daily or weekly DigitalGov newsletter to receive more great content like this delivered to your inbox!